Yves Klein (28 April 1928 – 6 June 1962) was a French artist considered an important figure in post-war European art. He is the leading member of the French artistic movement of Nouveau réalisme founded in 1960 by art critic Pierre Restany. Klein was a pioneer in the development of performance art and minimal art. He is best-known for his Monotone Symphony, the development of the color International Klein Blue, his 'living brushes' of Anthropometries of the Blue Period, the celebration of nothing in Zone of Immaterial Pictorial Sensibility and his photomontage Leap Into the Void. His work is documented in the film Yves Klein, la révolution bleue (2006) which has footage of the 'living brushes' paintings and of his appearance in the Mondo cane shockumentary. Between 1947 and 1948, Klein conceived his Monotone Symphony (1949, formally The Monotone-Silence Symphony) that consisted of a single 20-minute sustained chord followed by a 20-minute silence – a precedent to both La Monte Young's drone music and John Cage's 4′33″. During the years 1948 to 1952, he traveled to Italy, Great Britain, Spain, and Japan. In Japan, at the early age of 25, he became a master at judo receiving the rank of yodan (4th dan/degree black-belt) from the Kodokan, which at that time was a remarkable achievement for a westerner. He also stayed in Japan in 1953. Klein later wrote a book on Judo called Les fondements du judo. In 1954, Klein settled permanently in Paris and began in earnest to establish himself in the art world. Although Klein had painted monochromes as early as 1949, and held the first private exhibition of this work in 1950, his first public showing was the publication of the Artist's book Yves: Peintures in November 1954. Parodying a traditional catalogue, the book featured a series of intense monochromes linked to various cities he had lived in during the previous years. Yves: Peintures anticipated his first two shows of oil paintings, at the Club des Solitaires, Paris, October 1955 and Yves: Proposition monochromes at Gallery Colette Allendy, February 1956. Public responses to these shows, which displayed orange, yellow, red, pink and blue monochromes, deeply disappointed Klein, as people went from painting to painting, linking them together as a sort of mosaic. The next exhibition, 'Proposte Monochrome, Epoca Blu' (Proposition Monochrome; Blue Epoch) at the Gallery Apollinaire, Milan, (January 1957), featured 11 identical blue canvases, using ultramarine pigment suspended in a synthetic resin 'Rhodopas,' described by Klein as "The Medium." Discovered with the help of Edouard Adam, a Parisian paint dealer, the optical effect retained the brilliance of the pigment which, when suspended in linseed oil, tended to become dull. Klein later deposited a Soleau envelope for this recipe to maintain the "authenticity of the pure idea." This colour, reminiscent of the lapis lazuli used to paint the Madonna's robes in medieval paintings, was to become famous as International Klein Blue (IKB). The paintings were attached to poles placed 20 cm away from the walls to increase their spatial ambiguities. The show was a critical and commercial success, traveling to Paris, Düsseldorf and London. The Parisian exhibition, at the Iris Clert Gallery in May 1957, became a seminal happening. To mark the opening, 1001 blue balloons were released and blue postcards were sent out using IKB stamps that Klein had bribed the postal service to accept as legitimate. Concurrently, an exhibition of tubs of blue pigment and fire paintings was held at Gallery Collette Allendy. For his next exhibition at the Iris Clert Gallery (April 1958), Klein chose to show nothing whatsoever, called La spécialisation de la sensibilité à l’état matière première en sensibilité picturale stabilisée, Le Vide (The Specialization of Sensibility in the Raw Material State into Stabilized Pictorial Sensibility, The Void): he removed everything in the gallery space except a large cabinet, painted every surface white, and then staged an elaborate entrance procedure for the opening night; The gallery's window was painted blue, and a blue curtain was hung in the entrance lobby, accompanied by republican guards and blue cocktails. Thanks to an enormous publicity drive, 3000 people were forced to queue up, waiting to be let into an empty room. Later in the year, he was invited to decorate the Gelsenkirchen Opera House, Germany, with a series of vast blue murals, the largest of which were 20 metres by 7 metres. The Opera House was inaugurated in December 1959. Klein celebrated the commission by travelling to Cascia, Italy, to place an ex-voto offering at the Saint Rita Monastery. The offering took the form of a small transparent plastic box containing three compartments; one filled with IKB pigment, one filled with pink pigment, and one with gold leaf inside. The container was only rediscovered in 1980. Sometimes the creation of these paintings was turned into a kind of performance art—an event in 1960, Anthropométries de l'époque bleue, for example, had an audience dressed in formal evening wear watching the models go about their task while an instrumental ensemble played Klein's 1949 The Monotone Symphony (a single 20-minute sustained chord followed by a 20-minute silence). Klein's work revolved around a Zen-influenced concept he came to describe as "le Vide" (the Void). Klein's Void is a nirvana-like state that is void of worldly influences; a neutral zone where one is inspired to pay attention to ones own sensibilities, and to "reality" as opposed to "representation". Klein presented his work in forms that were recognized as art—paintings, a book, a musical composition—but then would take away the expected content of that form (paintings without pictures, a book without words, a musical composition without in fact composition) leaving only a shell, as it were. In this way he tried to create for the audience his "Zones of Immaterial Pictorial Sensibility". Instead of representing objects in a subjective, artistic way, Klein wanted his subjects to be represented by their imprint: the image of their absence. Klein's work strongly refers to a theoretical/arthistorical context as well as to philosophy/metaphysics and with his work he aimed to combine these. He tried to make his audience experience a state where an idea could simultaneously be "felt" as well as "understood". As well as painting flat canvases, Klein produced a series of works throughout his career that blurred the edges between painting and sculpture. He appropriated plaster casts of famous sculptures, such as the Winged Victory of Samothrace and the Venus de Milo, by painting them International Klein Blue; he painted a globe, 3D reliefs of areas of France and dowels which he hung from the ceiling as rain; He also stuck sponges to canvases and painted dinner plates. Many of these works were later manufactured as editioned multiples after his death. The critic Pierre Restany, whom he had met during his first public exhibition at the Club Solitaire, founded the Nouveau Réalisme group in Klein's apartment on 27 October 1960. Founding members were Arman, Francois Dufrêne, Raymond Hains, Yves Klein, Martial Raysse, Daniel Spoerri, Jean Tinguely, and Jacques Villeglé, with Niki de Saint Phalle, Christo and Gérard Deschamps joining later. Normally seen as a French version of Pop Art, the aim of the group was stated as 'New Realism=New Perceptual Approaches To The Real'. He moved on to exhibit at the Dwan Gallery, Los Angeles, and traveled extensively in the Western U.S., visiting Death Valley in the Mojave Desert. On 21 January 1962, in an elaborate ceremony in which Klein dressed as a Knight of the Order of St Sebastian, he married Rotraut Uecker, sister of German artist Günther Uecker, at Saint-Nicholas-des-Champs, Paris. His last works included painting geophysical reliefs of France and casting his friends' torsos, painting them blue, and attaching them to gold-leafed supports. 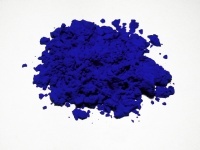 The Brisbane band Yves Klein Blue is named after Klein's International Klein Blue. Alongside works by Andy Warhol and Willem de Kooning, Yves Klein's painting RE 46 (1960) was among the top-five sellers at Christie's Post-War and Contemporary Art sale in May 2006. His monochromatic blue sponge painting sold for $4,720,000. Previously, his painting RE I (1958) had sold for $6,716,000 at Christie's New York in November 2000. In 2008, MG 9 (1962), a monochromatic gold painting, sold for $21,000,000 at Christie's. FC1 (Fire Color 1) (1962), a nearly 10-foot long panel created with a blowtorch, water and two models, sold for $36.4 million at Christie's in 2012. Unless indicated otherwise, the text in this article is either based on Wikipedia article "Yves Klein" or another language Wikipedia page thereof used under the terms of the GNU Free Documentation License; or on original research by Jahsonic and friends. See Art and Popular Culture's copyright notice. This page was last modified 13:53, 3 May 2014.